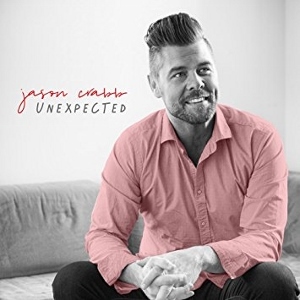 Today we take a look at the latest album from Jason Crabb, Unexpected. Unexpected is not the reality of this new recording, it is actually everything we as listeners have come to expect from Jason Crabb. Staying true to his roots while providing pop and CCM sounds. Unexpected is a return to Southern Gospel record label Daywind. Surprisingly, the return to Daywind gives listeners a less Southern Gospel friendly recording than Jason’s previous effort; Whatever The Road (2015). The album comes barreling out of the gate with the ‘hard driving’ country tune, “Expect The Unexpected”. Flavors of Jason’s past with the Crabb Family show in this particular song. The first single from the recording, “Washed By The Water”, is the most Southern Gospel friendly song on the album. The funky melody lends to the overall appeal of the song. There is enough progressive Southern Gospel sounds in Jason’s cover of “Chose To Be My Friend” to make it enjoyable. The Crabb Family originally recorded the song in 2001 (Living Out The Dream). Rascal Flatts member Gary LeVox joins Jason for this number. Speaking of Duets, Kaya Jones joins Jason on the modern country ballad, “Let It Be Love”. Jason goes mainstream country on the song “Short Are The Years”. A familiar trope of not letting life pass you by; enjoy every moment because short are the years. Jason deserves kudos for contributing his songwriting talents to seven of the ten songs on the album. Strongest songs included in order: “Washed By The Water”, “Expect The Unexpected”, “Day One”, “Chose To Be My Friend”, “The Love In Your Heart Knows The Way”, “Love Will Have The Final Word” and “Let It Be Love”. Stylistically, Unexpected might find trouble appealing to a mainstream Southern Gospel listener. Whatever The Road (2015) gave Jason 4 top ten singles on the Southern Gospel radio chart, two of those going #1. I was hard pressed to find two songs on Unexpected that could be top ten hits. Weakest songs included in order: “Mercy We Can’t Go Beyond” and “He Made You”. Jason Crabb has built a fan base unmatched by most Southern Gospel artists; appealing to a broad spectrum of listeners. Unexpected will appeal to Jason’s core fan base. For the more mainstream Southern Gospel listener, Unexpected doesn’t match the caliber of Whatever The Road (2015). I’m really digging this record more than any of his other solo albums. I didn’t remember Chose To Be My Friend and didn’t have the writer info but could tell it was Gerald. It is pretty cliche-ridden and doesn’t say anything fresh BUT the vocals are killer—they could be singing Mary Had A Little Lamb at it would rock.